The Risk & Assurance Group (RAG) is pleased to announce it will be hosting the ceremonial presentation of the first award to be granted by Risk Reward Awards, a non-profit organisation dedicated to promoting exemplary work in the field of risk management within the telecoms sector. The Lifetime Achievement Award will be given to individuals who have contributed, collaborated, driven innovation and improved risk management in the telecoms industry. 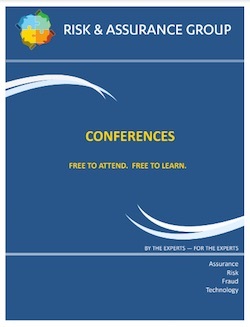 Winners of the Lifetime Achievement Award will be entered into the Risk Reward Hall of Fame. Four awards will be granted annually, and they will be given on a regional basis, beginning with the award for work done in Europe. Later in the year there will be awards given for work performed in the Middle East and Africa, Asia and Australasia, and the Americas. I am proud to be promoting this great initiative. Real authentic recognition is long overdue in the telecoms industry for individuals who have contributed to the prevention of fraud, bad debt and revenue loss. We need the newer individuals in this space to see that the risk industry is recognising their endeavours and contribution. The European Lifetime Achievement Award will be presented at the RAG London Conference in April 2018. There is some great work taking place in telecoms risk management but it doesn’t always get the appreciation it deserves. It’s easy to celebrate victories, but our industry needs to do more to reward the professionals who mitigate and prevent losses, because their work can be just as valuable. These new Risk Reward Awards will really help to raise the profile of telecoms risk management. We at RAG share the same outlook as our friends at Risk Reward Awards, and we wish them every success. RAG is very proud that the first ever Lifetime Achievement Award will be presented at our conference in London this April. Risk Rewards will be shortly launching a voting and polling mechanism to allow individuals in the telecoms risk space to nominate their colleagues and peers for the Lifetime Contribution Award. The nomination process seeks to identify individuals who deserve to be recognised through the time they have contributed, and the way their effort, knowledge and experience has been used to introduce new techniques for risk management, instigate training and education programs, and encourage collaboration within the telecoms risk industry. The award will celebrate contributions from any individuals working in the field, whether they are employed by telecom service providers or consultants, vendors, industry bodies or regulators. 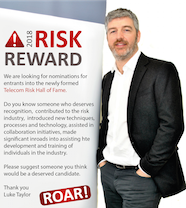 Risk Reward Awards is a non-profit organisation consisting of a small group of people who have been in the risk industry for many years and are frustrated with the lack of recognition for businesses, individuals, consultants and vendors within the telecoms risk space. The company was founded to instil innovation, collaboration, and importantly recognition by peers within the industry. The awards are judged by risk management experts in an unbiased environment. The ultimate objective is to promote risk management within the telecoms sector to ensure it receives necessary recognition for its endeavours. You can learn more about Risk Reward Awards by visiting their website.